6th class are holding their cake sale tomorrow Friday 27th April 2018 so please remember to send in at least €1 per child tomorrow to buy a bun or cake. Only 2 cakes sales left after tomorrow and they will be managed by our junior and senior infants with the help of 5th and 6th class. Dates to follow. Last time this 6th class will host their cake sale so please support! This year we will have a 100km full adult cycle to Clonakilty fee is €40 but discounted to €35 for pre registration online. Refreshments included in Clonakilty. Registration will be online www.kinsalecyclechallenge.com or at Kinsale Community School from 8.30 am. 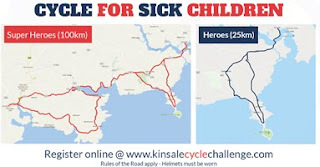 Kinsale and District Lions’ Club is totally voluntary with all monies raised going directly to the charitable causes. No administration costs are ever diverted away from this. There is a children's fancy dress party and spring storytime organized in Kinsale library for this Saturday 21st of April at 3pm, to mark world book day. Fancy dress is not compulsory, just a bit of optional fun. The idea is for children to dress up as their favourite characters from stories. Everyone who attends will receive a small prize, and there'll be one award of a €20 euro book token. 2018 Auditions April 22nd at The Old Cork Waterworks Experience. Lee Road, Cork. 10am-4pm. Celebrate the 10th event of this Performance arts community initiative with us. Good communication is key to healthy connections between you and your children, making it easier to guide, teach, understand, support and even discipline. 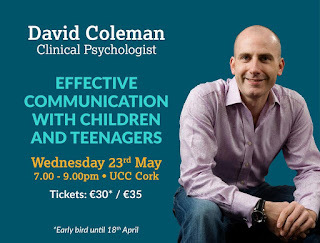 Breakdown in communication can leave parents feeling frustrated, desperate and hopeless, or worried about deteriorating relationships. But it’s never too late to make real changes, and very often small changes can have a big impact. In this evening presentation Clinical Psychologist David Coleman will guide us through the fundamentals of effective communication, translating psychological theories into common sense advice on how we can best respond to our children, and offering practical guidance for time-strapped, exhausted and stressed parents on how to raise resilient and emotionally intelligent children.